It has been a most unusual season for Lehigh. Starting the year off at 0-5 and getting swept in their out-of-conference schedule, the Mountain Hawks were in danger of having their season go off the rails. But two things have come together over the last five football games that have put Lehigh on the brink of back-to-back championships. The first is the late blooming of the Lehigh defense, which kept battling every week since the low point of the September 30th loss to Wagner to do the job in four of their five Patriot League conference games. The second is the development of junior RB Dominick Bragalone into a bellcow running back, a back who has to be in the conversation for Patriot League offensive player of the year. 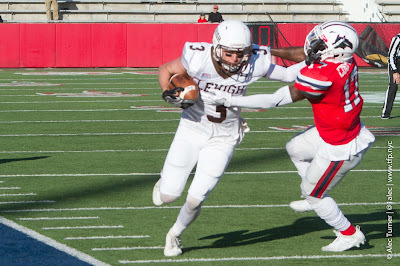 In five Patriot League games, Bragalone has run for 863 yards in 5 games, rushing for 11 touchdowns and adding two more receiving touchdowns as well. The South Williamsport, PA native certainly wasn’t unknown before this week – after all, as a freshman and a sophomore, he had already rushed for 1,000 yards in consecutive seasons. But this year, where he’s amassed 1,200 yard rushing and an FCS-leading 16 rushing touchdowns, he’s gone into full Monster Mode, and Lehigh fans are loving every minute of it.